THE RED FLAG WARNING IS NOW IN EFFECT UNTIL 1 PM PDT THIS AFTERNOON. THE RED FLAG WARNING HAS BEEN EXTENDED AS SCATTERED THUNDERSTORMS CONTINUE TO TRAVERSE MONTEREY AND SAN BENITO COUNTIES. A MAJORITY OF THE THUNDERSTORMS WILL BE WET...BUT NORTHERN MOST STORMS HAVE THE BEST POTENTIAL FOR DRY LIGHTNING. IN ADDITION...ERRATIC WIND GUSTS TO 25 MPH ARE POSSIBLE FROM ANY STORMS. A RED FLAG WARNING MEANS THAT CRITICAL FIRE WEATHER CONDITIONS ARE EITHER OCCURRING NOW...OR WILL SHORTLY. Space near Cupertino. Reservoir area, near Cupertino/San Jose on the western side of the Santa Cruz Mountains Fire is North of where the Croy Fire was about 4 years ago. Comms: CDF Cmd 4 tone 7, Command 4 is 151.400 - Local SCU 151.4450. Started from downed wires behind a residence. Reporting 50 ft flame lengths, unsafe for crews. Two helos and four tankers committed as of about noon. Updates: 80 acres in brush and timber, no estimate on containment, no structures lost. Additional Resource Request: 2 Helicopters, 4 Crews, 1 Immediate Need Type-3 S/T, 2 Lima S/T, Santa Clara County E-1,7,and Saratoga E-30 staged on Montabello for stucture protection Santa Clara County Fire brush protrols at incident. Lightning may have started two fires that burned homes near Paso Robles and Los Osos early Thursday morning, according to fire officials. The first blaze started at a house in the 500 block of Binscarth Road but was quickly doused by firefighters, according to County/Cal Fire officials. It was contained about 25 minutes after the fire was reported to officials at 12:50 a.m.
No one was injured in the blaze and damage to the home was estimated at $25,000, fire officials said. Morro Bay Fire Department assisted in fighting the fire. Another fire broke out around 3:30 a.m. at a house in the 2900 block of Pleasant Road just north of Paso Robles. Four people were home at the time and self-evacuated. No one was injured, fire officials said. Half of the house was burning when firefighters arrived at the scene. It was contained just after 4 a.m.
An estimate on damage to the house was not immediately available, fire officials said. San Miguel and Paso Robles firefighters assisted in fighting the blaze. Investigators were still looking into the cause of both incidents and said they could have been started by lightning from a powerful thunderstorm that pounded the county early Thursday morning. A thunderstorm over the drought Central Coast brought its share of rain but also sparked at least four fires in San Luis Obispo County and three fires in Santa Barbara County — one near the now-blackened footprint of the Zaca Fire, officials said. As of 5:30 this morning, the National Weather Service reported that .01 inches of rain fell in Santa Maria; .03 inches in Paso Robles; and .25 inches in Morro Bay — the highest level recorded in Santa Barbara and San Luis Obispo counties. A more accurate report of precipitation is expected to be released this afternoon. Officials counted some 2,000 lightning strikes over the Sisquoc River area since Wednesday night, and around 9 this morning, fire crews detected a lightning-caused blaze nearby, said Catherine Hibbard of the U.S. Fish and Wildlife Services. Zaca Fire suppression crews are currently battling the lightning-sparked blaze in the Sisquoc River drainage — about two miles west of the already-contained fire line on Foresters Leap Canyon. The estimated size or containment was not available this morning. Hibbard also said there were reports of heavy rains in some areas near the fire but she didn’t know how that impacted the flames of the still-burning Zaca Fire. Santa Barbara County firefighters were also busy in an area south of Lompoc where lightning is believed to have sparked a fire that consumed nearly 20 acres along Jalama Road, about five miles west of Highway 1. The fire was reported at 4:29 a.m. and was contained by county and Lompoc city firefighters around 6 a.m., said Brian Hayden, a fire engineer and spokesman with the county fire department. No structures were threatened. Hayden said the department was overflowed with calls Wednesday night reporting “a pretty severe weather system” from the South Coast to the San Marcos Pass, over the East Camino Cielo area and up to the Santa Ynez Valley. Most of the lightning strikes, however, did not develop into actual fires, Hayden said. One lightning reportedly sparked a small spot fire in the Painted Cave area but volunteer firefighters from the small mountain community reportedly put it out, he said. Cal Fire in San Luis Obispo County is currently fighting two vegetation fires — one sparked at 8 a.m. on a mountain near San Luis Obispo and another at 9:40 a.m. in the Santa Margarita area, said Capt. Greg Alex. No information on the size or containment was available. Overnight lightning was blamed for two house fires in the northern part of the county — one at 1:15 a.m. in Paso Robles and another 3:30 a.m. in the Los Osos area, Alex said. No injuries were reported in either of the fires, he added. Later this afternoon, Cal Fire is expected to fly over the county looking for new lightning-sparked fires, he said. .STRONG HIGH PRESSURE OVER ARIZONA WILL CONTINUE TO BRING HOT TEMPERATURES ACROSS SOUTHERN CALIFORNIA TODAY. READINGS ARE RUNNING SEVERAL DEGREES WARMER THAN YESTERDAY ACROSS LOS ANGELES COUNTY AND HUMIDITY VALUES ARE HIGHER. THIS WILL RESULT IN HEAT INDEX VALUES REACHING OR EXCEEDING EXCESSIVE HEAT WARNING CRITERIA OF 105 DEGREES THIS AFTERNOON IN MANY AREAS. IN ADDITION... NEAR RECORD HIGH TEMPERATURES WILL BE POSSIBLE TODAY. ... EXCESSIVE HEAT WARNING IN EFFECT UNTIL 7 PM PDT THIS EVENING... THE NATIONAL WEATHER SERVICE IN LOS ANGELES/OXNARD HAS ISSUED AN EXCESSIVE HEAT WARNING...WHICH IS IN EFFECT UNTIL 7 PM PDT THIS EVENING. NEAR RECORD TEMPERATURES ALONG WITH SLIGHTLY HIGHER HUMIDITIES WILL RESULT IN HEAT INDEX VALUES OF 105 TO 110 DEGREES THIS AFTERNOON ACROSS THE LOS ANGELES COUNTY VALLEYS AND MOUNTAINS. TEMPERATURES WILL SLOWLY COOL DURING THE EVENING HOURS BELOW HEAT WARNING CRITERIA. Wet line established by IA resources on suspected lightning caused fire. Resources on scene will continue to mop up with expected release of several resources begining this morning. Expect light mop up/patrol to continue possibly through tomorrow. Fire to be mapped today to determine accurate size. 43 personnel on scene, 40 of them county. Significant Events: Rapid fire spread due to dry fuels and thunderstorm generated winds. Remarks: Fire behavior included rapid rates of spread and long range spotting. Fire is burning on private and USFS lands. Fire has burned into Plummer Creek and has high potential to become established in the South Fork Trinity River. Fire is also established into heavy brush from 1987 fires. Observed Fire Behavior: Rapid rates of spread; long range spotting. Planned Actions: Continue flanking actions and burnout operations from established roads. CA-STF Have 3 fires that are being looked at for Fire Use- Jenkins, Hiram and Hollow. As for now all are under 1/10 of an acre. Had a total of 7 starts from lightning from last afternoons storm all above 6000 ft elev. Significant Events: Most of the constructed handl ine was lost with the increase in fire activity. Observed Fire Behavior: Crown fire was observed at the head with an up a hill run, with active flanking and backing fire. During the night a thermal belt is in the area and the fire is active until early morning. Planned Actions: Transition with a team, monitor the fire. Significant Events: Richardson Zone: Good progress was made with line improvements and mop up in all Divisions. Crews were able to mop-up remaining hot spots near the line in Division AA. Contingency line was completed in Branch XXV. Live Oak Zone: Progress is being made in the Suppression Rehab Branch. Remarks: Injury reported in Block 21 was due to a respiratory condition due to dust inhalation causing Bronchitis. Block 31 cont. : Live Oak Zone: Heavy brush containing high dead component. Some conifer at higher elevations. Live fuel moistures are at 45% which is well below critical levels. Observed Fire Behavior: Richardson Zone: Minimal fire activity was observed with no growth in the fire perimeter. 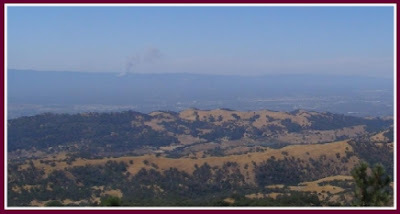 Live Oak Zone: Occasional smokes may continue to be seen from interior islands. Planned Actions: Richardson Zone: Monitor and mop-up/patrol in all Divisions 100' to 500'. Contingency planning will continue for Branch XXV. Continue to identify and complete Fire Suppression Rehab. Live Oak Zone: Patrol by air. Continue Fire Suppression Rehab.